Shirdi Sai Baba devotee Shobana Prathap from India says: I am Shobana from Tamilnadu And MP 48 Group. I am really happy to be a part of Mahaparayan. I have experienced many miracles of my beloved Sai. But this miracle which happened during Mahaparayan is really astonishing. As Baba says I will never let my devotees down and He confirms our faith towards Him by His sweet leelas. Last year 2017 my mother was predicted with cancer in her colon which was at a very very early stage. But for us we have never had any one suffering from cancer right from our ancestors. My mom is an ardent devotee of Baba. She suffered a lot before chemo was given to her. Last year August I happened to come across Mahaparayan. But I had no hope that I would be selected since only 5000 members would be given chance. I had doubt whether I could adhere to the rules each week and complete the parayan successfully. But I placed everything in Baba's feet and surrendered. I prayed to Baba that "Baba I took up this task please give my mom recovery ". I was selected for Mahaparayan and every week it was going on successfully with Sai' s grace. My mom was given 3 chemo. Suddenly she had got infected with lungs and chemo treatment was stopped. And I should say my mom was reading Satcharitra all through her chemo. It was painful to see her without hair. Since she used to have dense hair even at this age ( 57 years). After which lungs treatment went on. I used to tell my mom that Baba doesn't want to give you more than 3 chemo ( it's a 6 chemo for one cycle). Now she got recovered from lung infection. And last week she underwent PET scan. And lo that was a miracle she had no cancer cells active in her body and doctor told 3 more chemo are no more needed. I don't know how to thank my Baba. I love you Baba. As Baba says He takes the pain of His devotees and recovers them. Thanks a lot Baba, Love You ever. Yes my dear devotees Baba is hearing all our prayers and loves us more when we read His leelas. I could sense that He’s working more good things on my life during this Mahaparayan journey. Thanks a lot for all the good souls for creating such a platform. May Baba bless you all. If a man utters my name with love, I shall fulfill all his wishes and increase his devotion. If he sings earnestly of my life and my deeds, I shall surround him in front and back and on all sides. Those devotees who are attached to me heart and soul will naturally feel happiness when they hear these stories. Believe me, if anybody sings my leelas I will give him infinite joy and everlasting happiness. 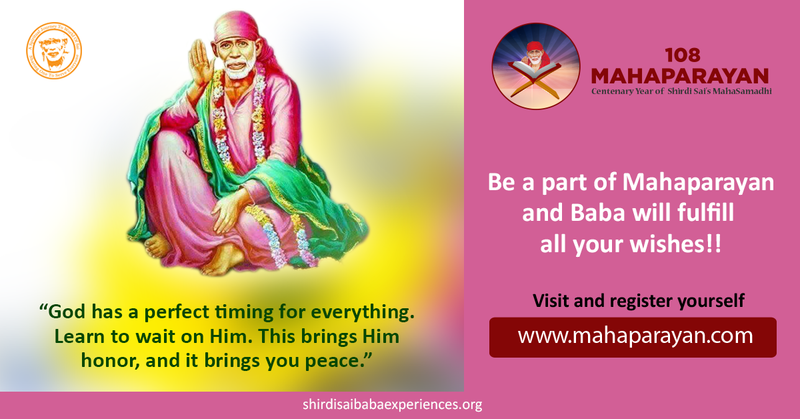 ~Shirdi Sai Baba. Please add me to a group as well as my mother is seriously sick due to Brain Tumor and my family is not doing well because of this.. I just need some miracle to happen so that my mother can lead a healthy life.